Siobhan Spillane Bailey has extensive experience in transactional real estate matters, corporate law, and commercial litigation. Siobhan has experience in representing clients including, lenders; commercial and residential real estate developers; owners, operators, purchasers and sellers of commercial and residential real estate. Specific experience includes: representing developers in subdivision applications, sale and construction of industrial improvements on property located in Urban Development Zone, requiring negotiation of construction contract and contract of sale, and license agreements, easements, leases, etc. with public and private entities. She has also represented banks in commercial lending transactions requiring negotiation and drafting of commitment and loan documents, review and disposition of title issues, closing of loans. 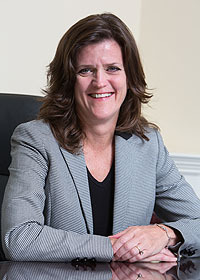 Siobhan’s experience also includes a broad range of corporate representation, including negotiating and drafting agreements between and on behalf of corporate entities; representing corporate clients in employment practices and policies, employee benefits, statutory compliance issues and negotiation and preparation of employment related agreements and documents. Through the years Siobhan has provided support to law firms in commercial and residential real estate matters, and in land use litigation. She has also served as title/loan closer on behalf of local title agencies. Experience in this capacity includes serving as a contract attorney in real estate department of Cole, Schotz, Meisel, Forman, & Leonard, P.A. In re Petition for Substantive Certification of Borough of Montvale, 386 N.J. Super. 119 (App. Div. 2006).